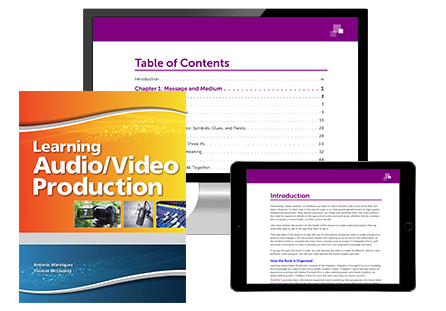 Learning Audio/Video Production helps students explore Audio and Visual Production career paths, while learning the media creation process and standard industry software applications. 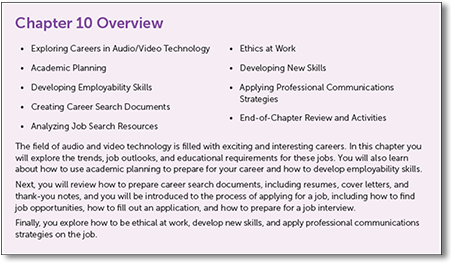 Video projects, as well as activities building critical employability and 21st Century skills, are integrated throughout to prepare today’s students for the workplace. Students will develop the skills to create 10 different, distinct, and authentic video projects while learning the media creation process. 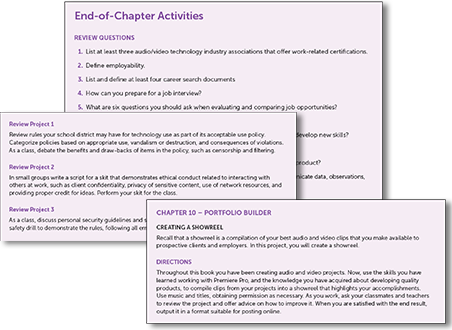 Each chapter begins with a listing of the topics that will be covered, followed by an overview of why those topics are important. Exercises include helpful notes and tips that provide information such as alternate methods of performing tasks. Feature boxes include more in-depth information on related topics, tools, short cuts, and professional methodology. 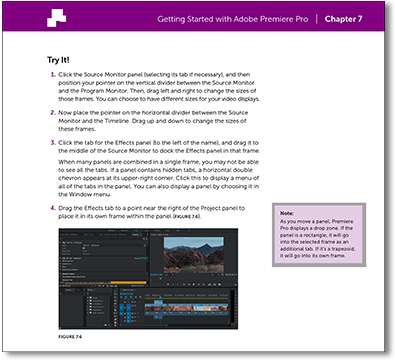 Each chapter concludes with Review Questions that test students’ knowledge of the chapter’s key points; Review Projects that provide an informal way to practice practical skills; and Portfolio Builder which challenges students to complete a themed media project using cumulative skills from previous chapters.